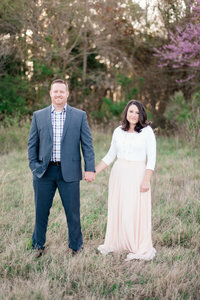 Where do I seriously begin with these two… Other than I am THRILLED to be shooting their wedding in April! Ben & Brittany are so laid back and so much fun! We did nothing but laugh throughout our time with them. We met up at Ben’s Grandmothers house. A Beautiful home on a gorgeous piece of property. We literally could have shot their for days! It was really neat because Ben grew up spending his weekends at this house. He was reminiscing with us about what he used to do as a kid and where he would go and hang out. There was a little well house that was so cute for pictures. As I was getting them set up Ben was telling us how this little house used to be the scariest place as a kid because it was so dark inside and him and his cousins used to put each other in there. I told him if he twitches when he sees his pictures at this spot, we will understand why. In all seriousness though, this couple is gorgeous inside and out. They both radiate so much happiness and love for one another. We are so excited for their wedding coming up this next year! Enjoy some of our favorites of this gorgeous couple! Brittany…. You are STUNNING! You are going to be one GORGEOUS Bride! I am so excited!!! LOVE the fall leaves! And with her ring…. So Pretty! On the side of the little house that Ben wasn’t crazy about… But he was a good sport! We could have shot on the dock all day! It was gorgeous lighting and they were perfect!